BATON ROUGE, La. 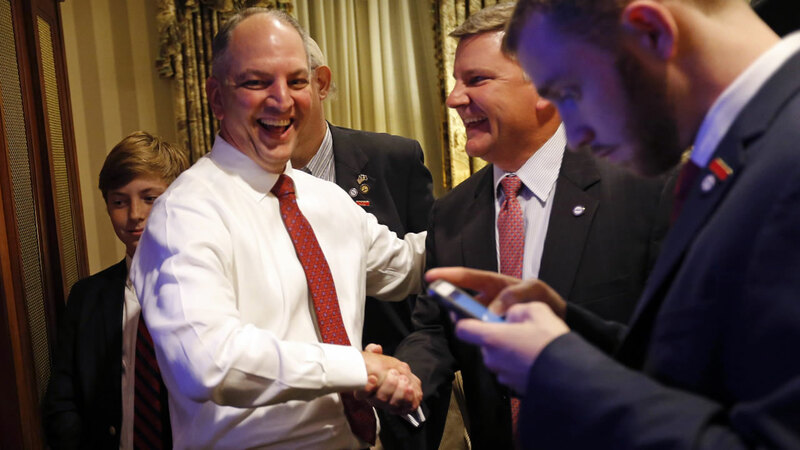 -- Democrat John Bel Edwards won the runoff election for Louisiana governor Saturday, defeating the once-heavy favorite, Republican David Vitter, and handing the Democrats their first statewide victory since 2008. Edwards, a state lawmaker, will take over the office from term-limited Republican Gov. Bobby Jindal in January. Voters' rejection of Vitter was a stunning turn of events for the U.S. senator, who has been a political powerhouse in the state for years and started his campaign nearly two years ago as the race's front-runner. Edwards painted the race as a referendum on Vitter's character and integrity and suggested the U.S. senator didn't measure up in such a competition. Edwards focused on his West Point degree and military resume, and he pledged a bipartisan leadership style. In the final days, Vitter sought to rally Republican voters who stayed home in the primary by drawing policy distinctions with Edwards and making Syrian refugee resettlement an issue in the state campaign. But it apparently didn't work. Edwards is taking over a state awash in financial problems. Neither Edwards nor Vitter offered detailed roadmaps for tackling the budget woes, and the general outlines they touted were largely similar in approach. Rather than a race about the state's deep financial troubles, the contest for governor largely became a referendum on Vitter, who has been in elected office, first as a state lawmaker and then in Congress, for more than 20 years. Vitter began the election cycle nearly two years ago as the clear favorite, expected to have an easy waltz into the governor's office. He stockpiled cash for the campaign, dwarfing all competitors with his fundraising acumen. And with a campaign operation that has helped him and his allies to steamroll opponents over the years, he appeared nearly unbeatable. But Vitter was hit with repeated attacks for a 2007 prostitution scandal in which he apologized for a "serious sin" after he was linked through phone records to Washington's "D.C. Madam. He had trouble uniting Republicans after a blistering primary competition in which Vitter trashed two GOP rivals and received heavy criticism for his scorched-earth political style. And his campaign was accused of ethical improprieties after allegations it secretly recorded political opponents. Vitter's negatives with voters shot up in the polls. The U.S. senator also was hampered by high disapproval ratings for his fellow Republican, Jindal, who is blamed for the state's financial problems. Edwards started his campaign as a little-known lawmaker from rural Tangipahoa Parish, about 75 miles north of New Orleans. He benefited from a primary in which he largely escaped attacks while the Republicans slammed each other. He capitalized on voters' apparent unease with Vitter and built a campaign on personal integrity. With his anti-abortion and pro-gun stances and tenure as an Army Ranger, Edwards downplayed his Democratic roots, positioned himself as a moderate and said he'd govern in a way that unites the state, claiming Vitter would bring his divisive, Washington-style politics to Louisiana. In speeches, he pledged: "I will be honest with you. I will never embarrass you." Vitter said Edwards was misrepresenting a record filled with votes supporting teacher unions and trial lawyers and opposing business interests and education reform efforts. "His campaign is built on a myth that he is some sort of a conservative, that we don't differ on the issues, when we definitely do," Vitter said. The candidates did little to mask their distaste for each other in the two televised runoff debates, both of which escalated into near shouting matches at various points. Each runoff contender sought to tie his opponent to an unpopular figure in Louisiana: Edwards claimed Vitter would represent a "Jindal third term," while Vitter tagged Edwards as an "Obama liberal." Edwards also continued to strike at Vitter for the prostitution scandal, most notably when he ran a TV ad that said Vitter missed a vote to honor soldiers because of a phone call from the prostitution service, choosing "prostitutes over patriots." Vitter eventually answered the scandal more directly, with a TV spot in which he said he "failed my family" and with an ad featuring Willie Robertson from reality TV show "Duck Dynasty" saying, "I know he's made some mistakes, but who hasn't?" Even supporters wondered if the effort might have been too late. At least $30 million was spent in the race, from candidates and outside groups who have played a larger role in this year's competition than in prior state elections. When the final campaign finance reports are filed, the contest is expected to be the most expensive governor's race in Louisiana history.